There have been many attempts over the years to create a magical grouping of heroes under the Justice League banner. 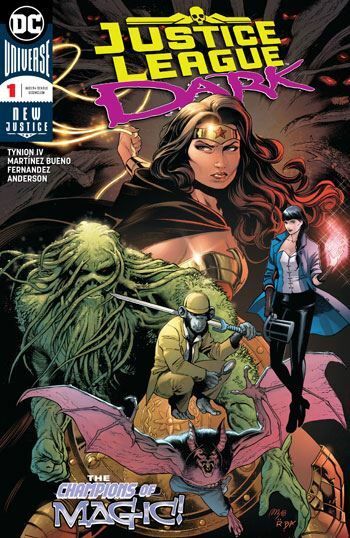 During the new 52 the first Justice League Dark was launched, but despite some potential, the book never really got itself together. Before that, there had been Shadowpact, born out of Infinite Crisis. Once again a grouping of magical heroes, though as oddballs and outcasts, rather than Justice Leaguers. I really loved that book, and was sad to see it cancelled. So I was more than pleased to read the latest launch of Justice League Dark, which brings back some of the elements and characters of Shadowpact, and looks like it might be a successful blend of the two concepts. Zatanna is front and centre, as one would expect in any mystical version of the League, and Wonder Woman is given a significant role as well. Despite being a character derived from Greek mythology, Wonder Woman was not often placed into the “magic hero” category, but fits quite well into it. Wonder Woman is also the driving link between this book and the Metal series, with the mysterious trees being at a core of the problem that the various characters in the book have to deal with, that magic has gone haywire. Man-Bat makes a curious addition to the team, but is an interesting choice. Swamp Thing, who hasn’t been used well in quite a while, might prove to be a welcome choice. I love the character, but it’s hard to find something to do with him that hasn’t already been done. Being part of a team might be away around that problem. But hey, I may as well just reveal the big selling point for me. Detective Chimp! I just cannot get enough of this guy, and the fact that he is part of the team is all I need to know. And with the Chimp comes the Oblivion Bar, another great location, not really seen since the demise of Shadowpact. Loads of other magical characters make cameos in this story, meeting to discuss how to deal with the crisis in magic taking place. I hope (and expect) that many of them will return in later issues. This is an extremely promising first issue, one that made me genuinely excited for the run.